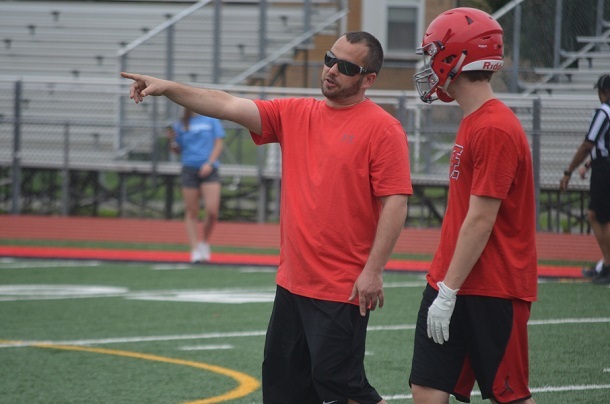 It’s taken a while, but the Bridgeport High School football team’s new coaching staff is in order. With the departure of full-time coaches Jason Nicewarner and Brett Hathaway and the one-year volunteer run of Robert Marra complete, Coach John Cole had more than just off-season conditioning to worry about. Now, those worries are cast to the side. With Tyler Phares filling one full-time position and former Indian football standout Sean Snider h andling the volunteer duties, Cole has announced who is handling the final spot. Although not a familiar name to Bridgeport fans or the local football scene, Cole believes he has a winner in Casey Stewart. 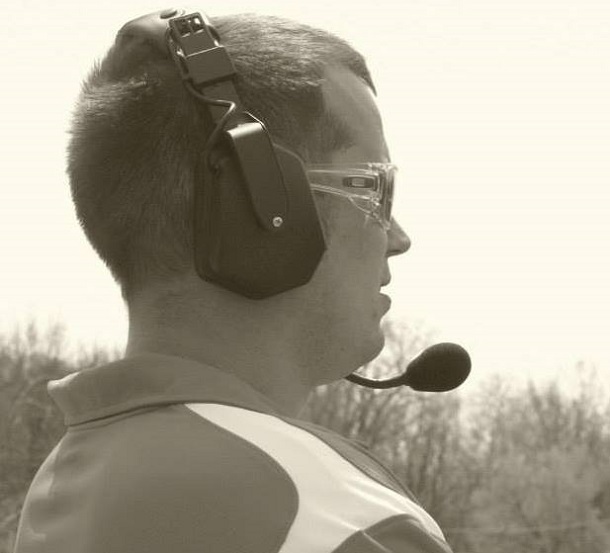 Stewart not only brings high school experience to the staff, but he also has former Division II coaching experience. Now, he’s finding out about the Indians – a program he knew about from his own time living and playing football in West Virginia. Stewart played football at Woodford County (Kentucky) and then had two moves in West Virginia where his father Buck coached, including Braxton County and Calhoun County. It was in Calhoun County in 2001 where he wrapped up his playing days. At that time, he thought he wrapped up his time with football for good. “I was 18 and had some offers to wrestle in college. I thought I needed to get into the business world and make money and moved to Minneapolis and did just that. It took about three years before I was convinced I didn’t like it,” said Stewart. The result was Stewart calling to talk to his father about feeling that he was heading in the wrong direction. His father, knowing sports was in the family blood, told his son to come back home and coach. To see if football coaching was for him, Casey Stewart called his cousin. His father was well-known in high school football circles. The cousin was well-known in collegiate circles in West Virginia and beyond. “I called ‘Uncle Bill’ who is my second cousin,” said Stewart. Uncle Bill turned out to be – at the time of the phone call – a West Virginia University assistant football coach. Eventually, Stewart would become the head coach in Morgantown. Of course, observing is one thing. Getting a chance to coach is another and Stewart needed an opportunity. It came in form of a phone call from former Glenville State College Coach Alan Fiddler. “He gave me a volunteer spot and told me if everything would go right maybe I could get on to the staff. I worked my tail off and got onto the staff as a running backs coach,” said Stewart who was busy picking up college credits and eventually a degree at the same time as he walked across the stage in 2009 at GSC. Fiddler eventually left Gilmer County. 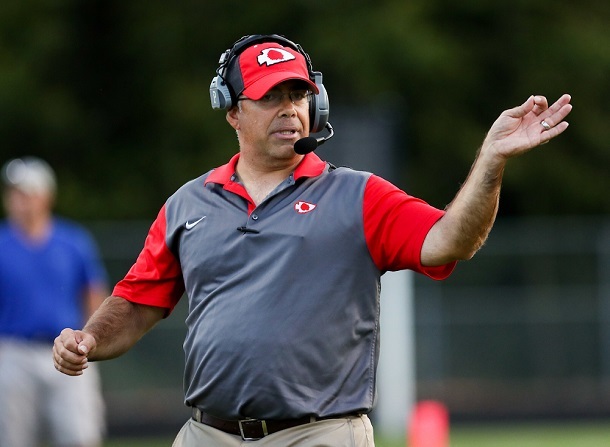 He took a coaching gig at Patrick Henry High School, a large high school in Virginia that has produced several professional athletes including more than one NFL player. When he got there, he remembered the young man who was coaching his defensive backs and running backs with the Pioneers. Still, there was moving in the future. At Patrick Henry he worked his way up to defensive coordinator and then moved on in 2016 to become the head coach of a small Single A school in southwestern Virginia called Rural Retreat High School. Eventually commitments on the personal and family front had him looking elsewhere. The Indians’ new assistant Phares was the one who, as mentioned above, put him in contact with Cole about the Indians’ opening. Stewart is glad to be here. And glad he learned about the position. If you’re in Stewart’s family, football heaven is the only place to be. His father spent decades coaching with family ties going back into the dominating era of Sistersville High School. Stewart is now enjoying his time with the Tribe. He’s gotten to know them during the three-week practice session that just wrapped up. He’ll likely get to know them more during summer conditioning. Cole is thrilled to have him. 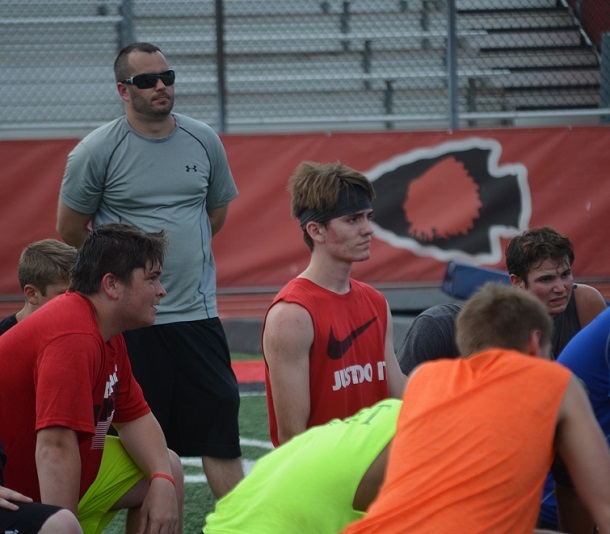 Editor's Note: Top two photos show Casey Stewart during the June drills, while Coach John Cole is shown during regular season action last year. At the bottom, Stewart is shown during his time at Patrick Henry High School.